The day of your wedding can be a whirlwind. With emotions and nerves running high and family and friends running around, it can be difficult to keep your thoughts straight let alone your things. We have put together a wedding day checklist for you so nothing can be left to memory or chance. Before we get started with the items to remember, we want to make a few suggestions. Take pictures before the ceremony so you don’t miss your own reception running around the city. If you don’t want to see each other before the ceremony, at least get the family photos out of the way. Creating a list of all of the family photos will help make the process go smoothly. Eat before the cocktail hour begins. Itinerary/timeline for the day (for the bridal party as well) – this is respectful to your caterer too. Try to stick to the timeline as much as possible so you don’t compromise the integrity of your food. Steak can only be medium for so long. Checks for Vendors (and tips in envelops for each). Don’t forget the wedding officiate! HAVE FUN and don’t loose focus of what this day is really about. 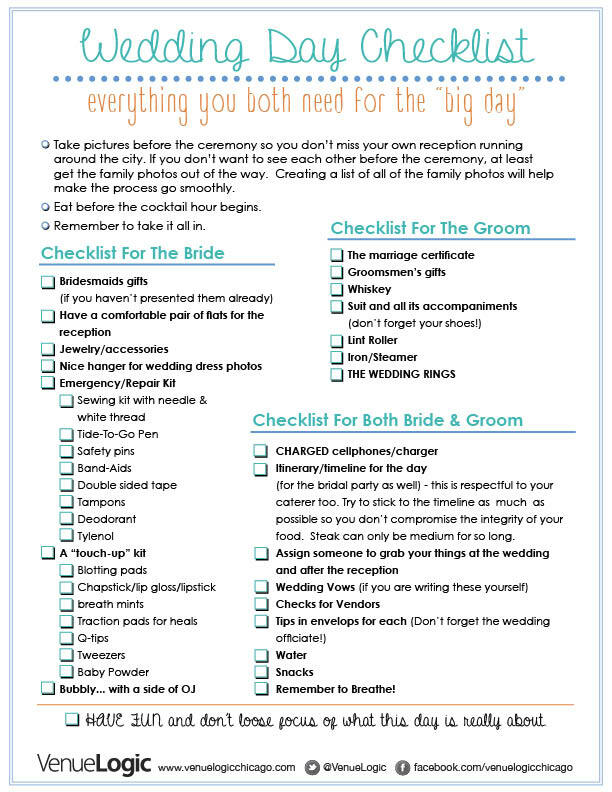 Click Wedding day check list for the printable version.